It's classic! And it's cool! Wow! If you were there during the glory days of rock music, you must have heard this powerful trio band. 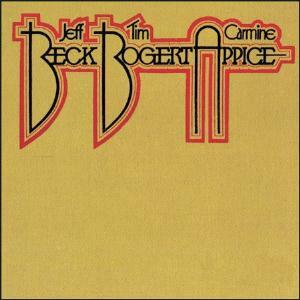 In this trio Beck invited Tim Bogert (of Vanilla Fudge) and one of the best rock drummers Carmine Appice. This sounds like Beck wanted to proof to the music industry that with just three people he and the bandmates could create great sound. I would say that BBA faced hed-to-head competition with American powerful trio Grand Funk Railroad at that time. The album kicks off with 'Black Cat Moan' which represents the blues rock style and contains excellent guitar work by Beck with his sliding techniques. 'Lady' and 'Oh To Love You' are ballads with good vocal line followed then with Stevie Wonder's 'Superstition' which was very popular during my teenage years. 'Superstition' became my favorite track at that time and firstly I was not aware at all that it was Stevie Wonder's. 'Sweet Sweet Surender' is another ballad followed with a rocker 'Why Should I Care'. 'Lose My Self With You' is an excellent song with a showcase of Beck's wah wah. Overall, this is a very good classic rock album with some blues rock favor. Those who really want to know what the sound of 70s is all about, this album can represent it. Keep on rockin'..! DragonForce "Inhuman Rampage World Tour" Live in Jakarta, May 19, 2007, Tennis Outdoor. Featuring fastest guitar virtuoso. Be There! Or Die!